One of my first cell phones had a version of Mancala (“Bantumi”) to play, and it was my first encounter with the ancient game. I played it way more than Snake, enjoying its simple elegance. The delightful puzzle of it kept me coming back, and helped me to discover there was this actual game called mancala, it wasn’t just something Nokia had dreamed up for a phone game. 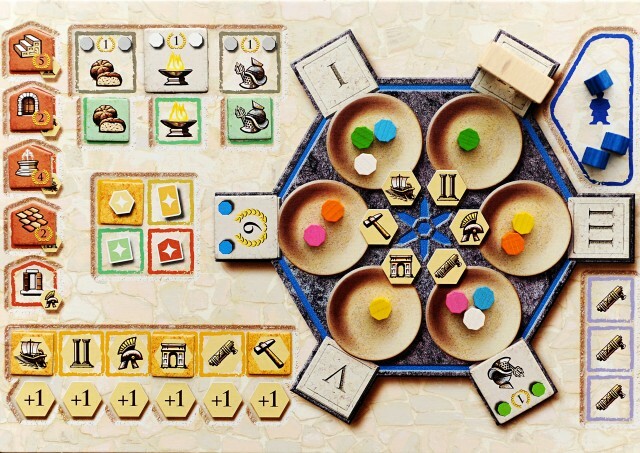 I’ve seen plenty of European strategy games that have rondels, but hadn’t come across one using specifically a mancala system for action selection until I tried Stefan Feld’s Trajan. 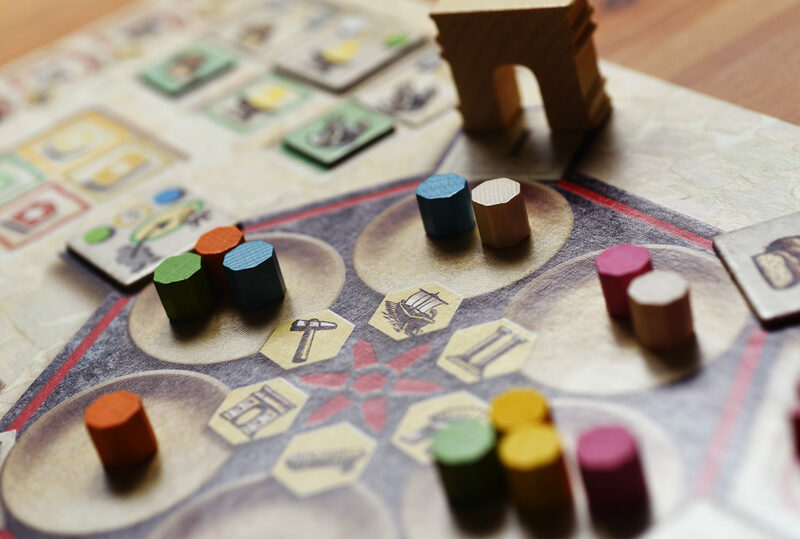 A while back, Sean wrote up a list of 5 Feld games he thinks are great, and Trajan made the cut. I figured I should give it a try, and it just so happens that Renegade Game Studios have released a reprint of the game which made it nice and easy for me! With no changes inside the box and just a little bit of a facelift outside, the new version will likely please folks who were waiting to get their hands on the out-of-print title. It looks a little dated to me art-wise – I think it could have been spruced up a little to match some of his newer titles, but I also think it’d be nice to see a whole other theme. You see, the theme doesn’t really matter here – not really to the point it could be fully abstract, but there’s nothing super inspiring. Spatially and action-wise, things do tend to make sense and tie together but I really don’t feel like the theme pops out, it’s a secondary feature to the game. Perhaps I’m being overly critical, seeing as my two other favourite Feld games are Carpe Diem and the Castles of Burgundy where, similarly, there’s somewhat of a vague interplay of the theme and actions taken, but truly it doesn’t matter in the end. But heck, a more modern theme for Trajan wouldn’t go astray! Imagine you’re representing a group of volunteers vying to receive funding to create an incredible national park, or even the CEO of a startup aiming to get seed money and provide the market with the products it’s demanding. Perhaps this would make a difference, or not – but I can dream. So here we are then, living in the Roman Empire under the Emperor Trajan and being the best we can be. Moving troops throughout the empire, collecting and shipping commodities, gaining influence in the Senate, constructing new and important structures and more – this is certainly one of the point salad-iest Felds I’ve had on my table. Because there are so many facets to the game, the way that the mancala guides you into the timing of taking certain actions is key to the game’s flow, as well as how the mancala ties into the game’s timer. This certainly wouldn’t have the same feel to me if the game was a strict length rather than variable (based on turns taken by players) or if I were left to freely select actions rather than the puzzle of the mancala. Let’s look at the mancala itself, and where it can really push the game around. On your turn, you will select a group of wooden tokens from one “bowl” of the mancala, dropping one off in each spot after until your last – which is the spot that defines your action for that round. Of course, it’s not always going to work out that you can end up on your preferred action spot, and it really could mess up the subsequent turns by interfering with the numbers of tokens in each bowl. In addition, the number of wooden tokens you’re dispersing will bump the game’s timer along that many spaces – so if you’ve accumulated a lot of those tokens you can push the game along somewhat. 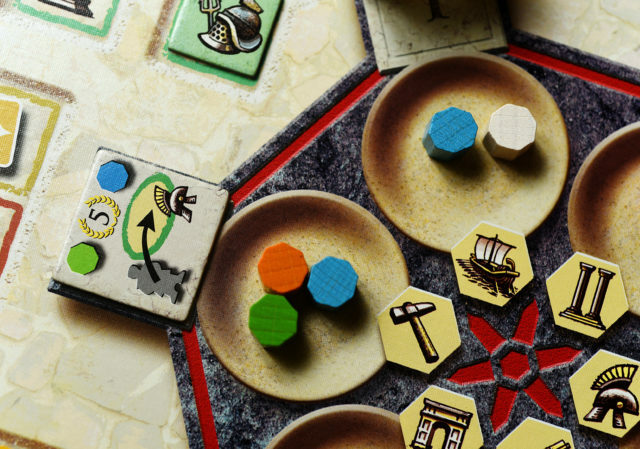 On top of all this, you’re eyeing off the “Trajan tiles” tucked away above each stop on the mancala – if you manage to end up with a combination of two specific colours of tokens where you end up, you’ll fulfill the requirement of that tile and gain its benefit. 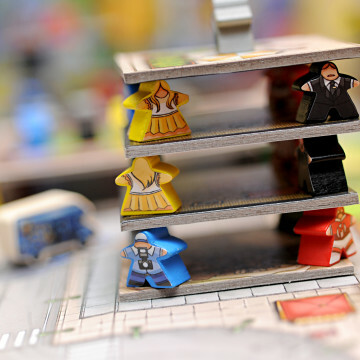 These are a great boon – you can get straight up points, commodity cards, workers out onto the board and more. It’s worth the fiddling of the mancala to churn through some of these throughout the game. You might wonder why I haven’t really gone into the specifics of the actions themselves, yet; honestly, the mancala is the stand out part of the game here, which is why I’ve focused on it so far. I enjoy the set collection aspect for commodity and shipping, the movement around the map to get troops out for bonus tiles and points, and the construction in the city for a variety of points and bonus actions – there’s a satisfying interplay of them all and like a great majority of European strategy games, you truly want to do all the things. 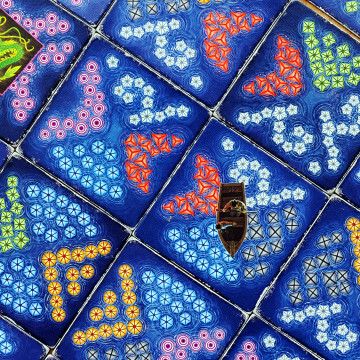 There’s absolutely a balance required among it all – you may find yourself leaning heavily on Senate influence for some bonus scoring tiles during one quarter, or perhaps spreading your troops out far and wide for victory points another – the timing and the distribution in your mancala movements will guide you somewhat, and opportunities arise where they may. One last thing I really enjoy in the ebb and flow of Trajan is “meeting the demands of the people” – one little nod to the theme of the game that I quite enjoy. Every quarter year, there are certain randomized demands revealed throughout rounds and at the end of that quarter year you will need to meet these demands or lose victory points (viciously!). 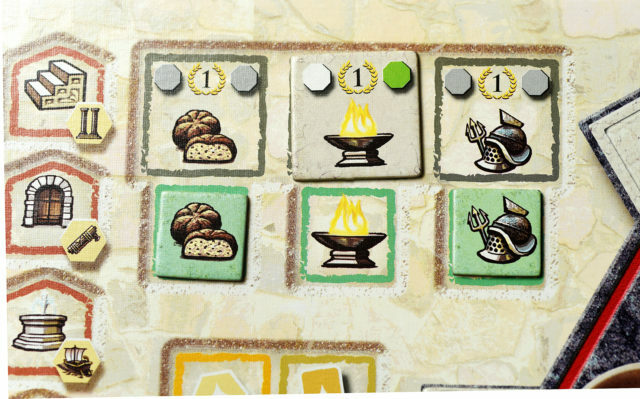 For instance, the people demand bread, and two helmets based on the tiles revealed – you can meet the demands by having gained a “permanent” token from a Trajan tile, or have collected a temporary token that is discarded at the point of checking. If you miss out on this, you can lose between 4 and 15 points, so it’s certainly an important thing to keep an eye on throughout the course of the game. This adds a great challenge on top of the balancing act of the rest of the game’s actions. Despite my nagging concerns about the theme falling flat (which is, let’s face it, not just an issue with this game), I can’t recommend Trajan enough. 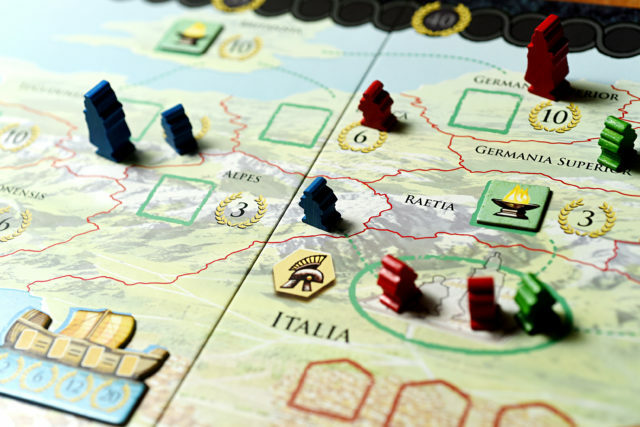 There are myriad strategy games out there with all sorts of action selection mechanisms nestled in with the rest of their gameplay – but I think Trajan stands out, even as a re-release among the glut of new games in the current market. If you like a little bit of the brain burn and puzzly goodness this will be right up your alley – optimize the mancala and head to victory! 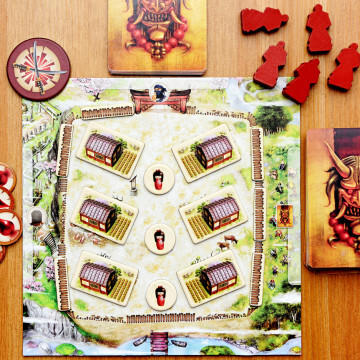 Trajan is a Euro strategy game for 2 – 4 players, taking between 60 – 120 minutes. Designed by Stefan Feld with art by Jo Hartwig, it’s been recently re-published by Renegade Games. Thanks to Renegade for sending along a review copy. Glory to Rome! Concentration, and Speed, and Accuracy, Oh My!